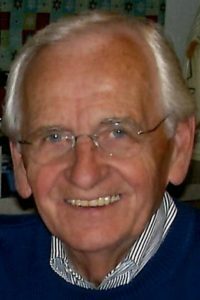 CARL TEGEL, of Solon, 87, passed away peacefully on Friday, January 18, 2019. Carl was born on July 25, 1931 in Antunowac, Croatia. He is preceded in death by his mother, Emily Richter and his father, Anton Tegel. Surviving family members include his beautiful, loving wife of 63 years, Mary Jean (nee Hudak). Carl was extremely loving and proud of his three children, Sharon (Paul) Marcela, Cynthia (Rick) Crouse and Dave (Esther) Tegel. Cherished grandfather of his seven grandchildren, Lauren, Kristen, Renee, Natalie, Nicole, Nicholas Carl and Anastasia. He is also survived by his brother John (Charlotte) Tegel of Solon, Ohio. Carl immigrated to the United States in 1949 to Cleveland, Ohio where he met his future wife at a church dance. He served in the US Army 510th Tank Battalion from 1955 to 1956 in Mannheim, Germany. Carl was a passionate man who worked as a barber for over fifty years and owned Carl’s Barber Shop in Solon, Ohio. In his spare time, he enjoyed gardening, had a passion for golf, traveling and visiting his children in Atlanta, Raleigh and Chicago. He was an active member of the Knights of Columbus #4893, a former Solon Jaycee and was an usher at St. Rita’s Church since 1967. Carl embraced life and was a friend to everyone he met. He approached life’s challenges with a positive attitude and he always saw the best in everyone he met. His resilient demeanor was passed on to his grandchildren through his positive mindset, endless optimism and his deep appreciation for all the gifts God had bestowed upon him. Mass of Christian Burial Friday, January 25, 11:30AM at St. Rita Church, 32820 Baldwin Rd., Solon. Family will visit with friends at Steinbauer Funeral Home, 33375 Bainbridge Road, Solon FROM 2-4 AND 6-8 PM THURSDAY, JANUARY 24. In lieu of flowers, the family suggests donations to St. Rita Church or St. Jude’s Children’s Research Hospital.